We're fond of the lovely 1859 Oregon Magazine and always look forward to receiving their new edition. We recently read Charlotte Dupont's joyful article, The Hunt for Spring Mushrooms, and would like to share it with you, our readers. There comes a time in every woman's life when she when she needs a little inspiration preparing a mushroom themed dinner. When that time arrives for me, I walk to my freezer knowing that there's a package of Trader Joe's Porcini Mushroom & Truffle Triangoli resting inside, waiting to add another tasty dimension to the night's dinner. The Triangoli was a delightful find at Trader Joe's. The pasta is light and delicate. Its triangular shape holds a savory stuffing that quickly generates rave reviews from all diners without breaking the bank - an 8.8 ounce container in Joe's refrigerator case costs about $4.00 in spite of the fact that it's imported from Italy. The pasta freezes well, and I typically freeze the pieces separately and then bag them as a unit for short term storage. This is such a satisfying pasta that a few pieces go a long way! 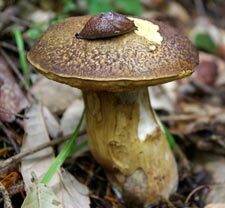 It appears that slugs also savor the flavors of boletes!